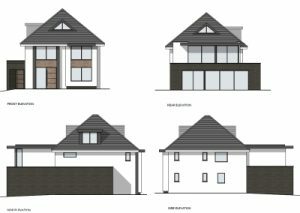 Bournemouth Borough Council: Darryl Howells has successfully won a householder appeal for alterations and additions to the existing house in Carbery Avenue, Bournemouth for the erection of a 2 storey contemporary extension at the rear, loft conversion and remodelled elevations. The scheme drawn by local architects David James Architects & Partners Limited but refused by Bournemouth Borough Council due to the design of the proposed extension to the rear and its large flat roof. Darryl’s arguments, which were agreed by the Planning Inspector, opined that whilst the modern would contrast with those houses of a more traditional design within the street however this in itself is not a reason to withhold planning permission as the scheme would be of high quality. Visibility of the flat roof extension would be limited due to the distance from the roadside and only glimpsed between buildings. The Planning Inspector concluded that the proposal would not harm to the character and appearance of the area in general and that by reason of its design, scale and form would not be an incongruous development within the street scene. In conclusion the Inspector advised “It is quite clearly in contrast to the form of the dwelling as it currently exists but, notwithstanding this, I consider the contemporary approach, which includes a high degree of fenestration to the rear elevation, would form part of a coherent whole. I say this, even though the eaves of the two storey extension would be higher than those of the original dwelling, the flank elevations of the proposal would be set in from those existing and I consider that the articulated form gives interest to its overall design. I also consider that the proposal complies with Policy CS41 of the Bournemouth Local Plan: Core Strategy (2012) which states that the Council will seek to ensure that all developments and spaces are well designed and of high quality”. If you have recently had planning permission refused and are considering what to do next, why not contact Pure Town Planning on 01202 585524 or email us at info@puretownplanning.co.uk for an assessment of your chances of success on appeal.